Hope your week has gone well and you will enjoy the weekend. It is so good to see and feel the sun again after so many dull, wet and dark days. Still a time to join in the challenge at Tag Tuesday where the theme this time is Black, White and a spot of colour. You could win a prize from Valerie if you name is chosen in the draw. I have used pieces of left over card for this tag. I tend to keep a pile of bits and bobs to try things out or mop up spills. They often turn to arty pieces all on their own. 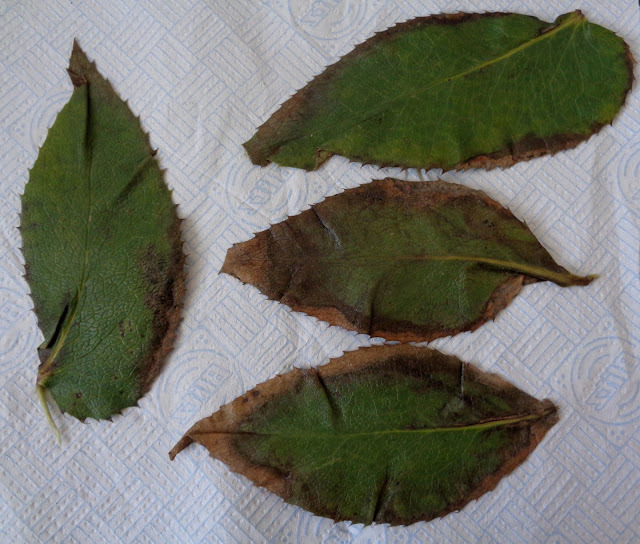 I collected some very large, winter helibore leaves from our garden. I usual dig leaves into the garden as compost but these leaves have really sharp spikes and can be dangerous if you are weeeding or trying to plant something in the ground. The biggest one in the picture is 7inches by 3inches. It was very difficult to show how shiny and bright they look after painting even in the sunshine. 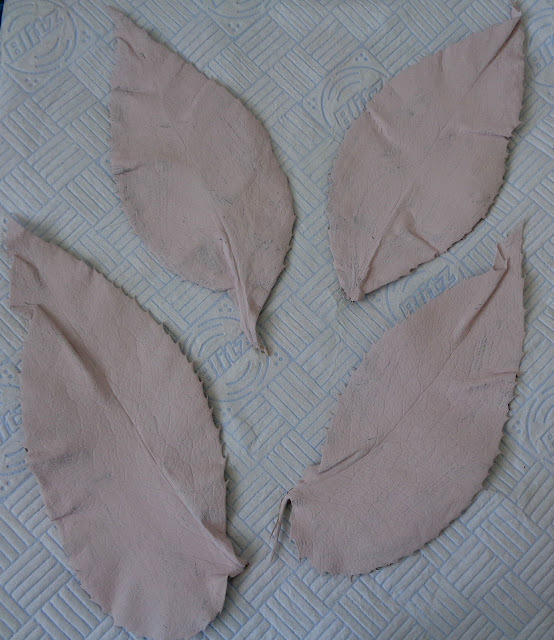 With a coat of light pink emulsion paint the leaves look like leather. I used odds and ends of emulsion paint( I buy the tester pots,) then some Dylusions ink sprays and the luxury AZTEC Metallics craft paint. I can see that these would be dangerous leaves, and if you are turning your compost pile, they could be dangerous there, too. But you made them look beautiful, and I agree that the under-painting made them look like leather. They turned out to be beautiful and are a great recycle project. 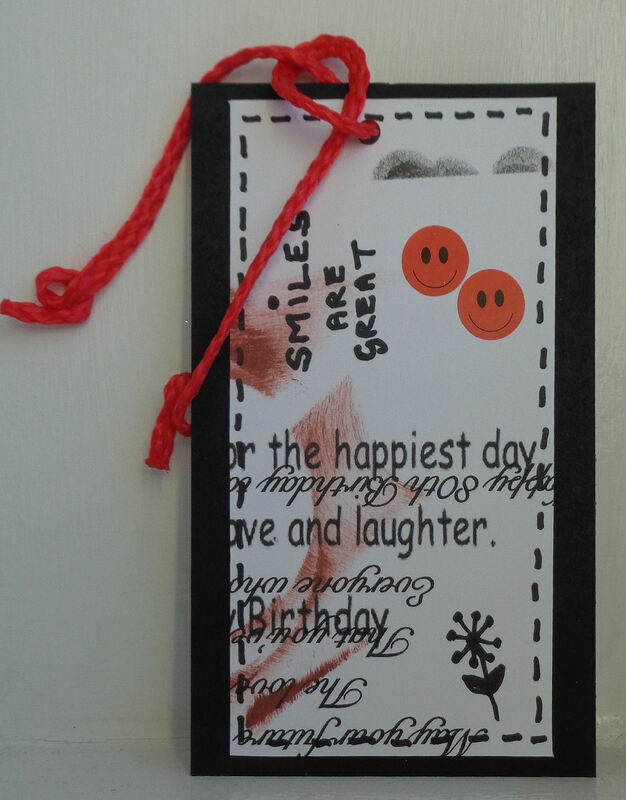 Your recycled tag is fun. I love that you chose the black background, too. Two great art projects today, dear Chrissie. Glad you joined Chrissie! Good luck for the draw! Your tag is so beautiful and I am in awe of your artistic leaves! Thank you very much for joining us at Try It On Tuesday again dear Chrissie! 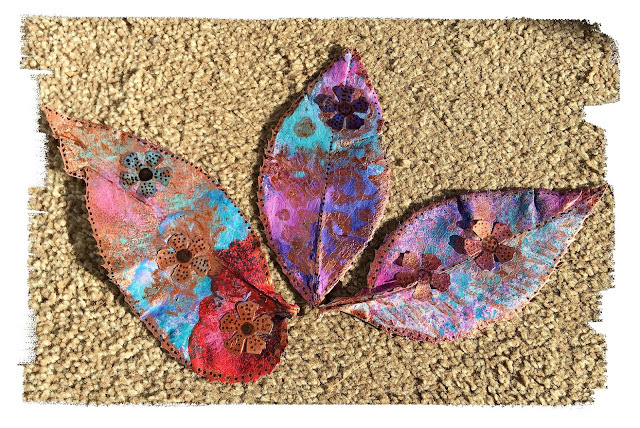 Chrissie these leaves look amazing, gorgeous detail and colours. I can imagine how they would feel to the touch, the spines do look prickly. Thank you for joining us all at TioT's. its good to see you there. The tag looks fantastic as well. 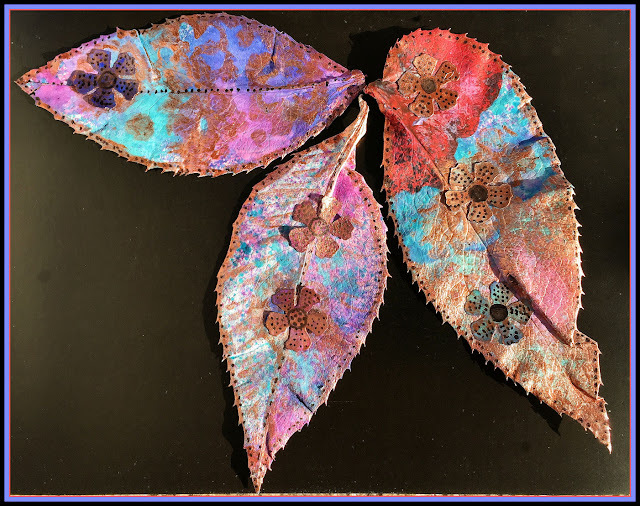 A fabulous tag and beautiful decorated leaves. Ooh, your painted leaves are just wonderful - what a brilliant idea. The faux stitching got me in the first photo - I assumed they must be some of your embroidery work!! Fabulous snazzy tag too. WOW Chrissie, these leaves look fabulous. I didn't realise they were real at first, and they do look like leather, such a brilliant idea. What a transformation!!! Your leaves look amazing after the colouring and embellishing!!! I love your chosen colorus!!! Thank you for joining the April challenge of the Country View Challenges! Thank you for all of your comments. Reading them brings precious moments. Isn't it great to be able to be in touch with so many nice people in this way. Thank you for calling in at Jumbled Crafts and I hope that you enjoy what you find here.